Americans can be startlingly ignorant about the world beyond their borders, and I am no exception. Before preparing to visit South America, I had exactly one association with Argentina: Nazis. It was in Buenos Aires that the Israelis nabbed Adolf Eichmann in 1960 and spirited him to Jerusalem for trial. Since I had a few days there before heading south to Patagonia, I decided it would be wise to figure out something to do in the city. Every website and guide book I consulted listed the Recoleta Cemetery as the No. 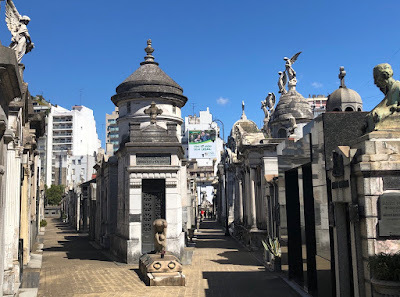 1, essential thing to do in Buenos Aires and, as fate would have it, my hotel, the elegant and refined Loi Suites Recoleta, was practically next door. Lonely Planet calls the cemetery "perhaps BA's top attraction" and every other source I consulted agreed in a chorus of unanimity. So I hatched a plan: go to the cemetery. At the same time worrying, slightly: what does it say about a city if its most alluring attraction is a graveyard? Only one way to find out. 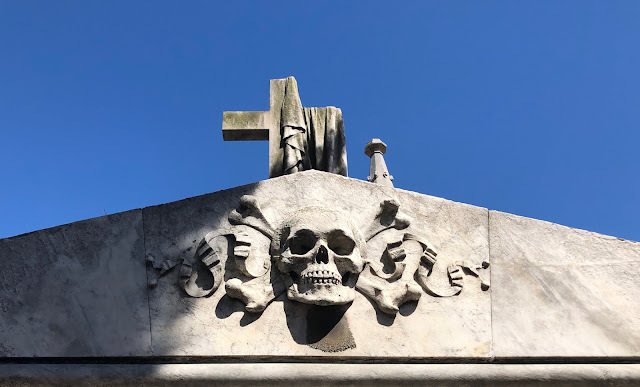 After a bracing coffee at an outdoor cafe, La Biela, we strolled to Recoleta Cemetery. Here I first saw the value of traveling with another person. I was ready to plunge into the cemetery, blind, using a long-established investigative process I call wandering-around-looking-at-stuff. But my former boss and current friend—a rare if not unheard of combination—Michael Cooke, immediately entered negotiations with one of the guides hanging around the entrance to the cemetery. A price was established—$20 US for the two of us for an hour. I was glad we did. Our guide spent well over an hour conducting us through this 14 acres labyrinth city of the dead, laid out like city blocks, marble and granite, black and white, some massive, others narrow, some tombs meticulously kept up by their families, others crumbling into ruin, while overhead crosses, domes, urns, plinths, and a platoon of angels, seraphs, Virgins Mary, mournful women and mustachioed men kept blind vigil. Our guide took enormous care explaining the lineage of the more noteworthy tombs. "This is the main avenue," said our guide, pausing before a tomb whose doorway was surrounded by nearly two dozen bronze plaques and wreaths. "And then there is the General Pacheco, he of our independent wars. This is the big plaque that included his portrait and all the battles where he participated as an officer, including the Cross of the Andes Mountains and the 10 most important battles in the war for the independence of Chile. The family of diplomatics and militaries: Pacheco was the other great grandfather of the President Aylwin. The father of his father was he of our independence, the General Loi. The father of his mother was General Pacheco. He of our independence, the father of his mother." 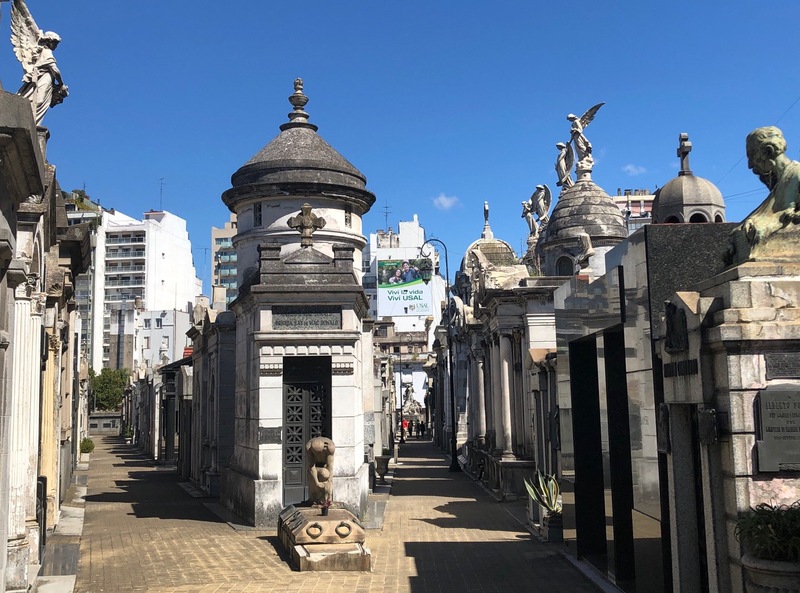 That might seem like heavy lifting, and I didn't follow it closely or 90 minutes, but gazed around, floating through Recoleta on a gentle sea of highly-accented verbiage. Yet somehow that felt perfect, and what sense I gleaned showed the importance of family ties in Argentinian society, so different from the U.S., where many people have trouble grasping the relationship between John Adams and John Quincy Adams. We went to the tomb of Luis Firpo—who knocked Jack Dempsey out of the ring in 1923, a moment captured by painter George Bellows. "The wild bull of the Pampas," I said, admiringly, showing off my knowledge of the first Spanish-speaking heavyweight contender. (Dempsey got back in the ring and won). 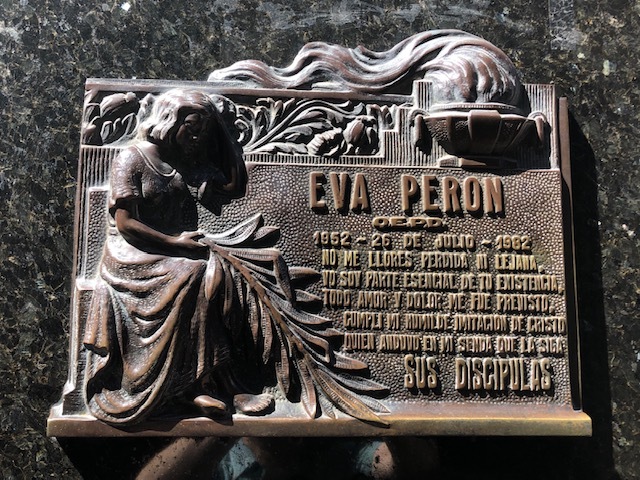 The Duarte family tomb where Eva Peron's body, after years of odd international post-mortem wanderings finally found its rest, is tucked down a nondescript avenue. I was never particularly enamored with Evita, so stood politely by while her entire history was narrated, taking a few dutiful photographs. Though we soon realized how lucky we had been, that no one was there when we approached. Passing it by later, the entire row was jammed with a tourist group. A number of tombs belonged to newspaper publishers, including a complicated statuary group that shows the inky benefactor slipping his coffin and ascending to heaven, a physical and moral impossibility. There were a surprising number of Irish names—about 4 percent of Argentinians have Irish roots; but I think I'll save that story for St. Patrick's Day. Our guide explained that Catholics can be cremated since 1969 (close: since 1963. One should always take the information provided by tour guides with a grain of salt, as we should see tomorrow). In fact-checking Catholic burial rituals, I noticed the church "earnestly recommends that the pious custom of burial be retained; but it does not forbid cremation" although it demands that the faithful inter ashes in a "sacred place" and not keep them in an urn at home or scatter them across a ballpark. 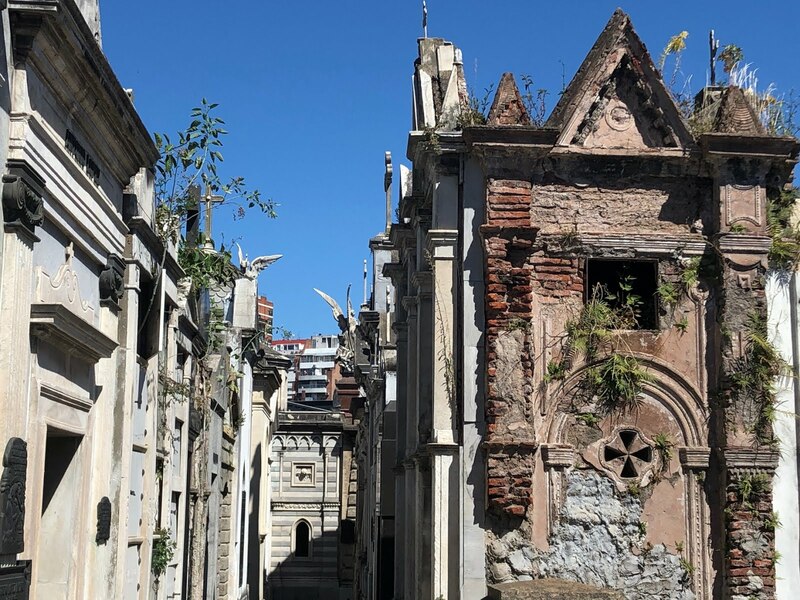 "So much death amidst life," Michael said, of the cemetery in the heart of one of Buenos Aires' most fashionable neighborhoods. "So much life amidst death," I countered, gesturing to the people wandering all around. I for one would like to see some of these travel blogs appear in the Sun-Times. I think the general public is ready for them. 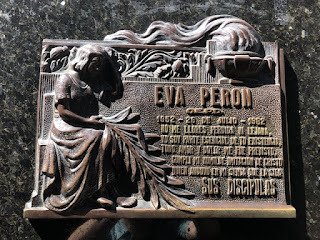 Here in Chicagoland, there aren't any cemeteries that I know of that rival the Recoleta, but there are some very interesting monuments to see all over, especially at Graceland Cemetery at Irving Park and Clark, including work by Laredo Taft and Louis Sullivan. Of course, I never took a look at them when I lived just across the El tracks from the place. Graves cannot be dug in New Orleans because it is so swampy and mostly below sea level, so there are similar cemeteries in the Big Easy. But their tombs are much smaller and farther apart. The corpses eventually decompose, and the bones fall to the bottom. This method of disposal is then repeated over the course of succeeding generations. One of the cemeteries was used for the notorious acid-trip scene in the film "Easy Rider"...look for a very young Karen Black in the role of a prostitute. I was lucky enough to be there one Mother's Day...one of only two days a year when the gates are thrown open to the public and they can mosey along the avenues of the dead. The other occasion is on All Saints' Day, November 1st. Probably a good way to extend your Halloween festivities. I was there on that date, too, but I was not aware that the cemeteries were accessible. Back when New Orleans still had many streetcar lines, including the famous "Desire" line, one of the other routes ran cars whose destination signs read "Cemeteries"... and there were even funeral streetcars available for hire, precluding the need for a hearse and a procession of private automobiles. A century ago, many cities offered this service (no pun intended), including Chicago. Tracking my roots I visited many of the Chicago area Catholic cemeteries where my ancestors are buried. While I have no belief in an afterlife it gives me comfort to visit the dead, remember their stories or make overdue apologies. Graceland is a better appreciated after making the family rounds. Driving through Mt. Carmel slowly brings the Prohibition Era into the present. I would take different slow routes when visiting grandparents and the notorious names on the elaborate crypts never seem to end. Take the proper path and near the exit you will probably encounter a car or three always parked in one spot. It is the Capone family plot where last time I encountered two New Yorkers smoking big Havanas. Not family, I asked hoping for stories, but just guys from Al's old neighborhood paying a visit. The grass below the flush grave marker is worn to bare earth from his many visitors, and these two had nothing bad to say about him. I didn't share my opinions and as that was my first time stopping at that spot, I feel better taking a different route after that day. Yes, he grew up in Brooklyn, which a lot of people are unaware of. Capone even lived on Navy Street as a kid, near the old Navy Yard, where he and his pals used to steal from the government. My grandfather is buried in Waldheim, near a family of four who all died on Christmas Day of 1908. Used to creep me out as a kid, and I always wanted to know what happened. After a lot of online searching, I finally found the answers, fifty-plus years later. An immigrant Jewish storekeeper came home late on Christmas Eve, from his West Side grocery, and hung his coat on the fixture for a gas jet. He went to bed. The pipe broke. He and his wife and their two daughters never woke up. But his kinfolk must have been rather prosperous, as their above-ground monument is the size of a compact car--something rarely seen in most Jewish cemeteries. So sad and tragic. At least I now know the story. As a teen, I used to envision such lurid scenarios...like murder-suicide or their deaths being the result of a neighbor's Christmas tree fire. I was a weird kid. Still am. I'm remembering our trip to Argentina several years ago and, as you did, feeling keenly how ignorant we Amerixans can be about other countries and culture. You associated the country only with Nazis; I assumed it's heritage was Spanish, because of course South America. Imagine my idiot-surprise to learn the city's population has a substantial *Italian* heritage -- ergo their love of Opera and the beautiful Opera House (Neil, you *did* see the Opera Hoise, please tell me you did? ), all the pizza and gelato joints, etc.